A strong component of who we are is to give back! 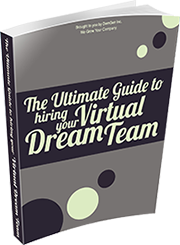 The DemGen team is fortunate to have many blessings both personally and professionally. We wish to share that with other entrepreneurs! 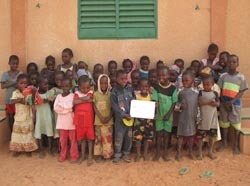 In recognition of a strong start to 2011, DemGen made a donation on behalf of our team, our clients, and our prospects to Pencils for Kids, an organization that provides classroom supplies, programs, libraries and schools to communities in need. 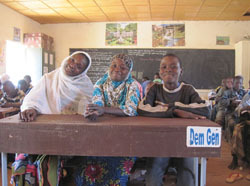 Pencils for Kids’ projects are currently taking place in Niger, West Africa, one of the poorest countries in the world according to the United Nations. They partner with the community of Liboré, which has a population of 24,500. Once they have identified the needs of the children, Pencils for Kids works with the community to design effective education projects and programs. DemGen’s donation will go towards purchasing desks and chairs for the many students who are still sitting on the dirt floor in many of the schools. Many students are still studying in shade hangars (straw construction) and have no desks or chairs at all. I wish there were words big enough and grand enough to thank the team and clients at DemGen Inc. for this incredibly generous donation to Pencils for Kids. It will have such an enormous impact on the lives of the children of Libore, Niger, who are struggling to get an education. The things we take for granted like pencils, notebooks and textbooks are like gold to them. And your compassion will truly make a genuine difference in their lives. We are overwhelmed by your kindness and thoughtfulness and will be in touch with you soon to discuss where the money will go. I want to have some conversations with the community first, but will be in touch very soon. Once again on behalf of our entire team at Pencils for Kids I want to thank you for joining with us in helping the children in the poorest country of the world have access to educational opportunities. It will mean the world to them. Just got back from Niger and it was a very successful trip. We met with our sewing girls, with our scholarship girls and began developing curriculum for our Farmers of the Future program. Very exciting!!! 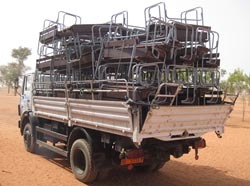 Sixty desks/chairs have now been purchased for the children of Libore and attached are photos of the delivery and many little children saying thank you!!! Enjoy! You have made a great difference to many children who no longer have to sit on the ground when they study. With DemGen’s founders based in the Toronto area, we also wanted to contribute to a worthwhile local cause. Knowing cold Canadian winters well, Project Winter Survival was the perfect fit! Dedicated to providing Survival Kits to the homeless and less fortunate in and around Toronto, they provide warmth and essential supplies needed for survival on the streets in the winter season. When disasters strike, we all feel the pull to do something. DemGen decided to contribute donations to relief efforts for recent natural disasters. Samaritan’s Purse is a wonderful organization that we contributed to for assistance with the Japanese tsunami. Mercy Corps is another excellent organization that we donated to for help with assisting after the Haiti earthquake. Both organizations provide international relief efforts with financial transparency.